The HS.748 aircraft was operating a scheduled flight from Southend to Paris via Portsmouth. It broke cloud using RAY Thorney Island GCA and made a circling approach to Portsmouth Airport. A normal touchdown was made about 330 ft to the left of the centre-line of grass strip 36 . During the landing run propeller ground fine pitch was selected followed by continuous application of the wheel brakes. At first the aircraft decelerated normally but at an advanced stage of the landing roll it became apparent that the aircraft might not stop in the distance remaining. An attempt was made to swing the aircraft to the left but, after starting to turn, it slid sideways and came to rest on an earth embankment. The aircraft was extensively damaged but there was no fire, or injury to the crew or passengers. CAUSE: "The primary cause was the inadequate braking which resulted from the extremely low coefficient of friction provided by the very wet grass over the hard, dry and almost impermeable sub-soil of the aerodrome. 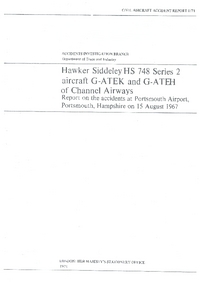 The fact that no account had been taken of the extra landing distance necessary for HS 748 aircraft on wet grass must be considered as a contributory cause since had this been applied Channel Airways HS 748 operation at Portsmouth would not have taken place. Distance from Southend Municipal Airport to Gosport-Fleetlands Heliport as the crow flies is 146 km (91 miles).